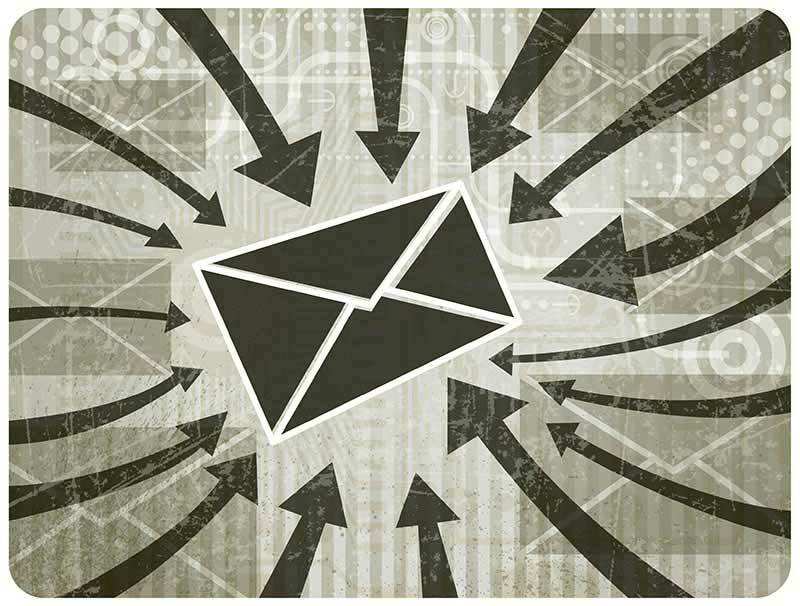 Marketo Data Tells Us: What’s the Truth Behind the Two Biggest Email Volume Myths? I hear this question from email marketers all the time: Does the size of my email send affect the performance? To answer this question, we’re going to play MythBusters! “The larger your email sends, the higher your unsubscribe rate”. This one seems reasonable. I feel like if you’re doing huge email size sends, your messaging is probably going to seem “spammy”, and so a larger percentage of recipients will unsubscribe due to irrelevance. Here, you’ll see email send size against unsubscribe rate. Each dot represents an email send from a customer. I’ve cut off the data at 1M emails because everything above that becomes a special case. There is no significant correlation here. In fact, you can see there’s actually a slightly negative correlation. Larger email sends actually have lower unsubscribe rates. This could be a result of companies with larger databases having more well-known brand names so they are more careful with their email campaigns. But, I think the opposite is true in that there are many “experimental” small email sends that are sent to “unknown” contacts. Myth busted! Email send size does not affect unsubscribe rate. Wow, this one wasn’t that intuitive. I assumed large email sends mimicked spam email which would warrant higher unsubscribes. 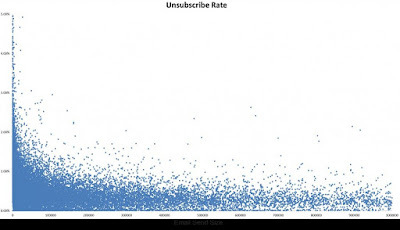 But the data shows that email volume size doesn’t affect unsubscribe rate. However, it’s important to note that several other factors such as frequency, content, and relevance do. Take a moment and think about your every-day email behavior: if could be seen as annoying or irrelevant, you’re probably going to take the extra effort to unsubscribe. “The larger your email sends, the lower your click-to-open rate”. Just like the first myth, this one looks plausible. Huge email sends dilute the messaging so I would imagine email performance would suffer. It’s hard to imagine one email would be relevant to millions of people, at least not relevant enough for them to click through. Here, you’ll see email send size against click-to-open rate. Each dot represents an email send from a customer. I’ve cut off the data at 1M emails because everything above that becomes a special case. There’s a very strong correlation here. If I were to sketch out the natural curves, it would look like a sideways funnel with a huge drop-off at around 20,000 to 50,000. 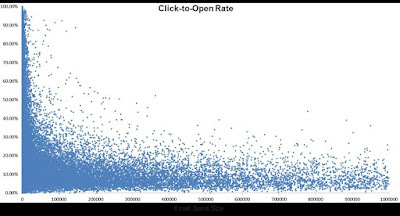 Email sizes above that rarely reach higher than 20% click-t0-open. This makes a lot of sense if you think of content relevance. More segmented email sends, with more targeted messaging, get more clicks. And for all you inquisitive minds out there, if you’re wondering about just click rate, yes, the exact same phenomenon as click-to-open rate occurs. Myth confirmed! Email send size is directly tied to performance. I love science! We proved an industry-old myth with data! But if you really think about this one, it makes a lot of sense. Open rate is tied to your subject line and sender info. Click rate is tied to your content and offering, which equals relevance. The larger your email sizes, the harder it is to stay relevant and have a compelling call-to-action that appeals to that audience. Especially after the email send size exceeds 20,000—where the average click-to-open band narrows to 3-18%. It’s very rare to escape that band. The main takeaway here is to find a good balance between the granularity of your segments and the relevance of your content or offering. If you have the resources, segment your email campaigns based on the audience persona (industry, demographic, geography, etc.) and behavior (e.g. looked at your product webpages). As a general “guideline,” the email size sweet spot is around 5,000. However, as long as your message is relevant and resonates with the recipients, you’ll get good email performance. It’s just very difficult to stay relevant beyond a certain audience size. Notice something in the data that stood out to you? Leave your comments below. #DIGITAL: Marketo Data Tells Us: What’s the Truth Behind the Two Biggest Email Volume Myths?